Ian Tregillis' first novel in his "Milkweed Triptych" (Bitter Seeds, see my review) was published in 2010. 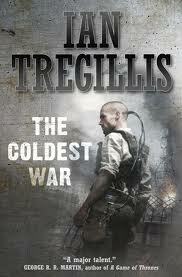 The Coldest War is the second book, just published last month, after a long delay due to the mishaps at Tor. (For an explanation of this, see Tregillis' blog for more details.) Coldest War takes place in 1963, almost twenty years past the aftermath of World War II. Due to the events of the first book, the world map has changed considerably. The Soviets control all of Europe, but the United States isn't a world power, which leaves it to the British to foil the Reds with covert spy operations. The Cold War is played out in this alternate universe, but with super-men controlled by the Reds and magic wielding sorcerers on the side of the UK. The novel picks up on the surviving characters from the first book. Most of them have suffered: Klaus and Gretel were imprisoned by the Soviets, who have dissected their powers and battery packs; Raybould Marsh, who left the government after his son was born with severe defects; Will Beauclark has recovered from his addictions but still haunted by the blood sacrifices made with the mystical entities known as the Eidolons. As the book opens, the sorcerers who saved Britain in World War II are being picked off by Soviet assassins--super-men powered by Gotterelektron 2.0, able to wield multiple powers instead of just one. At the same time, Gretel and Klaus make a daring escape from Russia and travel to the United Kingdom. Even more unnervingly, Gretel's power to see in the future doesn't appear to require the Gotterelektron. Gretel's playing an elaborate chess game with all the characters--a bombing operation conducted in the 1940s spurs Marsh out of exile and back into the operations of Milkweed, the British agency that manages the mystical war against their enemies. And there is a second generation of sorcerers, even more dangerous than the first one. I enjoyed reading this book even more than the first. Tregillis' writing and the pacing have matured and by the time I was halfway through, I had to keep reading until I finished it. The first half of the book works extremely well as a spy novel--if you have ever read or watched Tinker Tailor Soldier Spy you will enjoy it. The second half of the novel pays off this tension with some terrific action scenes. By the end, the characters are boxed into a corner so tight it seems like they can't get out of it. But if you remember Bitter Seeds, there was a scene in that book where a mysterious stranger appeared for one scene. That dovetails into the ending of The Coldest War and it illuminates Gretel's master plan. I can't wait for the third and final book, Necessary Evil , which won't be published until spring 2013. Nuff Said!